100% of entry goes to Alderton Acorns our much loved village PreSchool. Registered Charity No 1052664. Thanks for your interest in the Alderton 5k, we appreciate your support. 100% of your entry fee goes to help to support of Alderton Acorns, our much loved village pre-school. This guide provides all you need to know about the race. If you have any further questions our contact details are at the bottom. We pride ourselves on the friendliness of our run and in making all runners welcome, whether you're a complete beginner, an occasional jogger, under 16 or a more serious runner. You'll collect your race number and find everything that you need at Race HQ on Alderton Playing Field, GL20 8NL. Race HQ is open from 9.30am where you’ll collect your race number, find the playground and family entertainment, refreshments including teas and coffees and find the post-race massage. The start line is at the junction of Beckford Road and Willow Bank Road in Alderton, just outside the Gardeners Arms pub and 150 metres from Race HQ where you'll collect your race number. We’ll call you down to the start line five minutes before the start and give a short race briefing. Everyone lines up according to their expected finishing time, with the faster more experienced runners at the front and those expecting to finish later, further back. We'll start the race with a countdown from 3, 2, 1 and sound a hooter and you're off! Don't forget that the faster runners will start quicker - you don't need to start at the same speed as them! Adult entries are £10, Under 16's £5. We strongly encourage entry in advance from Eventbrite. This helps us manage numbers and reduces queues on the day of the race. However you can enter on the day from 09.30am on Alderton Playing Field. Race numbers are issued on the morning of the run on Alderton Playing Field from 09.30am until 10.55am. Please leave enough time to collect your race number and warm up! Just bring yourself, your name and a copy of your entry. There's no need to being any ID. Please ensure that you complete the contact details and any emergency health information on the rear of your number and affix it to the front of your running top. Safety pins will be provided. ​The race is an out-and-back course run on closed roads on scenic country lanes from Alderton. After the start at the junction of Beckford Road and Willow Bank Road you'll run up Beckford Road, past Race HQ on Alderton Playing Field and towards the hamlet of Great Washbourne. You'll pass Great Washbourne, go around the corner and then turn 180 degrees and go back on yourself 200 metres before the A46. The run returns back along Beckford Road towards Alderton where it will finish on Alderton Playing Field. You'll run back along Beckford Road towards Alderton Playing Field and will turn towards the finish by going through the five-bar gate, before doing a short lap of the football pitch and finishing near the penalty spot. The run route is clearly marked at all stages. Our volunteer small children will present you with your finishers medal and you'll be able to get a drink of water. The course has a small descent on the way out and a small ascent on the way back after the turn. It will feel harder coming back so keep some energy! Markers are provided at every kilometre. Please stick around for the presentation. We make this to the winners after the final runner has finished, usually between 45 and 50 minutes after the race start. Your support for the winners and presentations is appreciated. 100% of your entry fee goes to support Alderton Acorns our much loved village Preschool and Toddler Group. All of the administration and promotional costs are covered by our sponsors and volunteers​. ​Alderton Acorns is a Registered Charity number 1052664 and are a member of the Gloucestershire Playgroup and Toddler Association. You can find out more about Alderton Acorns at www.aldertonacorns.org.uk. Gloucestershire Highways have declined our request to formally close Beckford Road for the duration of the run due to the high cost and low perceived risk. We have advised the community in Alderton for several weeks about the run and to avoid the course and will do our best to limit traffic on the course by marshalling at each end of Beckford Road. In practice this means that the road will be substantially free of traffic but it is possible that the occasional car may enter the course. As such please take care and follow all the usual highway code procedures. In the event of minor injuries we have qualified first aider's available throughout the run. However please note that we do not provide a St John's Ambulance or similar service throughout the event and in the event of major injury or illness we rely upon the Gloucestershire Ambulance Emergency Service. Please ensure that you complete the information on the reverse of your race number and identify your emergency contact details and any illnesses or medication that we should be aware of. Under 16’s are welcome to run. Children under 10 should be accompanied on the run at all times by an adult. Our course is safety marshalled but neither the Alderton 5k nor Alderton Acorns can be held responsible for the safety of Under 16's and they remain the responsibility of parents or a responsible adult at all times. Water is provided at the start and in plastic cups at the turn after approximately 2.5km and at the finish. Based in Tewkesbury The Camper Van Factory are a specialised campervan conversion company who pride themselves in delivering high quality Volkswagen T5/T6 van conversions. ​With over 9 years experience in sourcing the correct base van and converting it to the perfect Campervan they're happy to welcome people to view their vans either fully converted or in the conversion process. Up & Running has been an integral part in runners training plans nationwide for over 21 years and we're still here to keep you motivated and achieving. We never stop thinking about you the runner and your running needs. ​On hand either in our store in Cheltenham, online or over the phone we are here to offer you expert advice and to help you choose the gear that's right for you. Parking is available from 09.30am next to Alderton Playing Field. Follow postcode GL20 8NL and parking is signposted. Please follow the directions of our marshalls. New in 2018 are the toilets in our small new pavilion on the Playing Field. There will inevitably be queues, especially for the ladies, so please leave enough time. Alternatively you can also use Gardeners Arms toilets, 200 yards from Race HQ on Alderton Playing Field and just by the start line. Provided by Becky from Gloucestershire Sports Therapy (www.glos-sportstherapy.co.uk) in exchange for a donation to Alderton Acorns. Becky advises that a post-event sports massage is designed to aid the athlete in recovering from their activity; flush out the lactic acid build-up, reduce post-exercise soreness and improve blood flow to tight muscles. Sounds good to us! 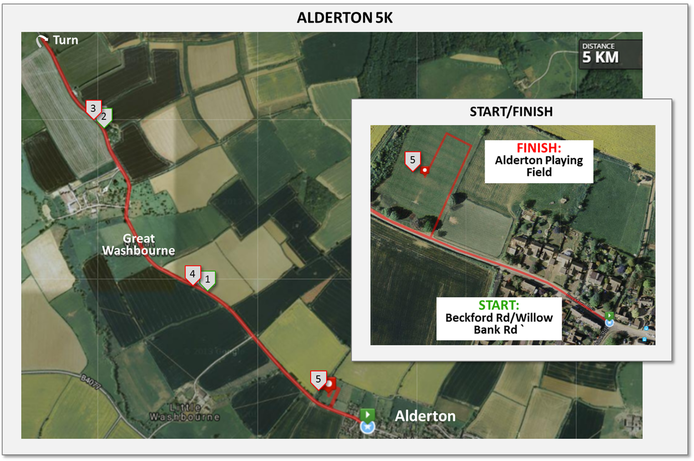 The Alderton 5k is family friendly with activities, games and refreshments available before, during and after the run. Alderton Acorns qualified staff provide a selection of outdoor games and activities for the little ones. Alderton Playing Field also has a nice shiny new playground as of Summer 2018. Please note that as a condition of our insurance we cannot provide a childcare facility/creche while you run so children must remain supervised by an adult at all times. We also have refreshments serving tea, coffee and cakes as well as stalls. If you can't run for whatever reason or want to transfer your number to a friend or family member then that's fine just contact us at mwjmail@gmail.com and we can help you out. All the information you need should be available at www.alderton5k.co.uk but if you have any other questions please contact Race Director Mark Watts-Jones on mwjmail@gmail.com or 07973 963539 at any time.